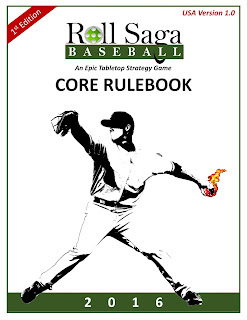 Many of you have been asking when we would post the online version of the Roll Saga Baseball Core Rulebook, 1st Edition (150 pages). That time has come! Not only will this facilitate game play for those of you that have your own Roll Saga Baseball game, but it will also help those that seek to better understand the depth and flexibility of Roll Saga Baseball as a whole. Remember that if you have any questions, we are available by chat, email, or telephone during regular business hours. No question is too small or trivial. Welcome to the Roll Saga Baseball blog, where we post articles, news, and updates about the game. We're always running promotions and offering our valued subscribers awesome deals that save you a ton of money. Plus, every month we'll be giving away complete games to randomly selected subscribers for free! Don't miss out! Interested in learning more about Roll Saga Baseball? Great! We've got a website that's packed with a plethora of information and videos just for you.